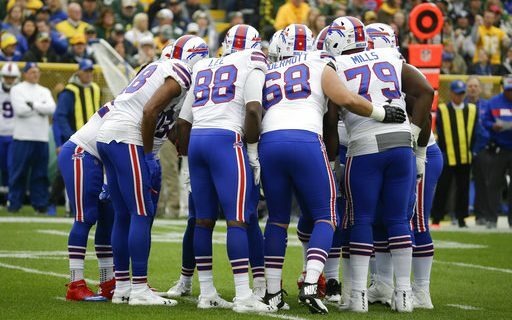 The Buffalo Bills have already won two games this season in which they were heavily favored to lose. Today in Houston they just may face the best opponent on paper they have faced this season. The Texans record is the same as the Bills, but when we look at their roster they should be much better. They don’t have many weaknesses. AT quarterback is second year pro Deshaun Watson, who has played much better early in his career than many young quarterbacks play. That shouldn’t be a surprise because as a collegian he got Clemson to the National Championship twice, winning once. This year he us completing 65% of his throws and has thrown for eight touchdowns and five interceptions. Watson has an excellent receiving corps in which to throw led by DeAndre Hopkins who is one of the better wide receivers in the NFL. The other two receivers who get a lot of play time are Will Fuller and Keke Coutee, both have slight builds but can take the top off a defense. Covering that trio will be a difficult task for the Bills. The tight end is Ryan Griffin who is a better receiver than blocker and is averaging 14 yards per catch on the season. If there is a weakness on the entire Houston team it is along the offensive line. The group has allowed 18 sacks to date and doesn’t do a good job opening holes for the run game. Leading rusher Lamar Miller has run for only 225 yards. The Texans start rookie Martinas Rankin at left tackle and the right tackle is Julie’n Davenport who is in his second year our of Bucknell. If the Bills are going to stop the Texans attack, they have to win the battle along the line. The defense is the heart of the Texans team and there is no shortage of Pro Bowl type players. They are led by defensive end J.J. Watt who is one of the best defensive linemen in the NFL. He leads the league in sacks with 6.0 in five games. Across form Watt coming off the edge is Jadeveon Clowney who when healthy can be a terror. Clowney only has 2.5 sacks to date but he is capable of breaking loose at any time. The leading tacklers in the Texans defense are the two inside linebackers, Zach Cunningham and Benardrick McKinney. The two have different type skill sets as McKinney is the big brawler and Cunningham is an instinctive athletic type with great range. They complement each other very well. An area that is usually strong for Houston is the secondary but injuries have hurt that group and they can be vulnerable. That said, the Bills passing attack is just about the worst in the League so the two off-set. For the Texans, starter Kevin Johnson is on injured reserve and his replacement Aaron Colvin is listed as being out for this game. Still they have two very strong players in the secondary in Kareem Jackson and Tyrann Mathieu. It will be interesting to see how this plays out. Overall, in order for the Bills to win they have to have a strong run game in to control the clock on offense. On defense the line has to put pressure on Watson in order to disrupt his rhythm of the Houston passing game. It’s a tall order but doable if the Bills play the perfect game.